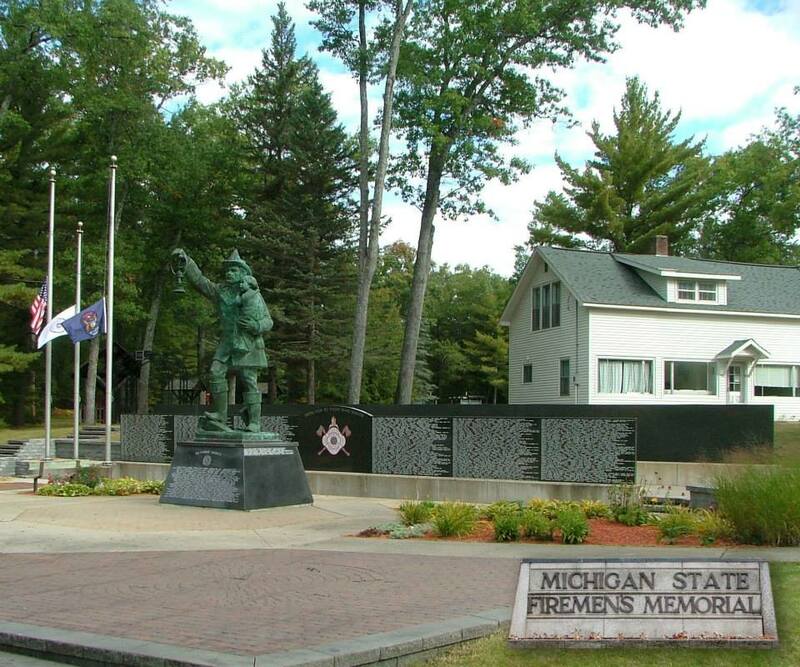 Apply for placement on Michigan Firefighter’s Memorial Wall – Click Here. 2018 Earl R. Alber Manchester Twp. 2018 Thomas "Peanut" N. Andersen Ronald Twp. 2018 Jack Artibee Flint Twp. 2018 Kenneth P. Bigelow Richland Twp. 2018 Michael Bishop Henrietta Twp. 2018 Orval "Spike" Branson Nottawa Sherman Twp. 2018 James F. Burt Home Twp. 2018 Dan Carrick Nottawa Sherman Twp. 2018 Robert Cousins Flint Twp. 2018 Ronald L. Daenzer Millington-Arbela Twp. 2018 Dennis W. Diener Winsor Twp. 2018 Carl Embrey Nottawa Sherman Twp. 2018 Daniel A. Fifield Goodland Twp. 2018 Ed Fox Nottawa Sherman Twp. 2018 Duane Francisco Irish Hills/Cambridge Twp. 2018 Howard B. Frye, Sr. Taymouth Twp. 2018 Daniel W. Golden Sand Lake Vol./Augusta Twp. 2018 Craig Greenway Flint Twp. 2018 Bud Haines Nottawa Sherman Twp. 2018 Ray Halberstadt Irish Hills/Cambridge Twp. 2018 Edward L. Haver Metamora Twp. 2018 Dan Huffman Nottawa Sherman Twp. 2018 Gary A. Illikman Spaulding Twp. 2018 Richard A. Jackson Palmyra Twp. 2018 Bernard F. King Winsor Twp. 2018 Gerald "Buck" E. Kirk Manchester Twp. 2018 Gale H. Koebbe Manchester Twp. 2018 Kenneth E. Koons Sand Lake Vol. 2018 Edward R. Kragenbrink Thomas Twp. 2018 Carl F. Lang Capac/Mussey Twp. 2018 Leon L. Litchfield Ronald Twp. 2018 Edward Lukas Owosso Charter Twp. 2018 Dennis W. Mann Ronald Twp. 2018 Jurry A. Maynard Arcadia Twp. "Lum"
2018 Gerald J. Messing Delaware Twp. 2018 Clayton Miller Nottawa Sherman Twp. 2018 Leo L. Nau Blackmen Twp. 2018 Carol A. Nurss-Miller Nottawa Sherman Twp. 2018 John Phelps Richland Twp. 2018 Roy C. Renwick Lincoln Twp./Jerome Twp. 2018 Thomas L. Ross Manchester Twp. 2018 Leon Schafer Nottawa Sherman Twp. 2018 Mick Schmalbach Nottawa Sherman Twp. 2018 Aaron D. Schumaker Norman Twp. 2018 Marvin J. Siewert Winsor Twp. 2018 Robert Simpson Flint Twp. 2018 Dennis Sitarz Irish Hills/Cambridge Twp. 2018 Walt Smith Nottawa Sherman Twp. 2018 Lawrence E. Smith, Sr. Higgins Twp./South Branch Twp. 2018 R.D. Sprague Nottawa Sherman Twp. 2018 Nelson D. Stone Arcadia Twp. "Lum"
2018 Robert D. Strain Fenton Twp. 2018 Bill P. Valeck James Twp. 2018 Robert M. VanHorn Bloomingdale Twp. 2018 Lyle A. Widmayer Manchester Twp. 2018 Wayne L. Wilcox, Sr. Fabius Park Twp. 2018 Al E. Woodley, Jr Metamora Twp. 2018 Gregory R. Wright Flint Twp. 2018 Carl W. Zobel, Jr. Taymouth Twp. 2018 Andrew J. Zwalesky Norman Twp. 2017 James H. Ackley Manistique Vol. 2017 Robert Amburgey Putnam Twp. 2017 Gerald R. Anderson James Twp. 2017 Vernon E. Annelin Cooks Vol. 2017 Lauren Bertke Manchester Twp. 2017 Wayne W. Bowden Venice Twp. 2017 Lloyd J. Briggs Hazelton Twp. 2017 James F. Buckeridge Port Huron Twp. 2017 Robert W. Desrochers Addison Twp. 2017 Clifford J. Dodson Leroy Twp. 2017 Dean W. Evans Marion Twp. 2017 William R. Faber Henrietta Twp. 2017 Paul H. Fox Ash Twp. 2017 Thomas J. Girard Spaulding Twp. 2017 Walter G. Gratz Kimball Twp. 2017 Marlin F. Groleau Kalkaska Twp. 2017 Rollie S. Grossman Manchester Twp. 2017 Donald F. Heim Almont Twp. 2017 Michael E. Hendee Putnam Twp. 2017 Jim Kensler Manchester Twp. 2017 Thomas J. Kochan Putnam Twp. 2017 Clark "Skip" E. Losey Bath Twp. 2017 Don P. McInerney James Twp. 2017 Kenneth L. McKeage Gerrish Twp. 2017 Andrew Messina Ira Twp. 2017 Andrew J. Meyer Frenchtown Vol. 2017 Robert "Bob" S. Moore Commerce Twp. 2017 Raymond G. Nichols Vernon Twp. 2017 F. A. Rubey Venice Twp. 2017 John R. Shannon Clyde Twp. 2017 Kevin S. Sikkema Georgetown Twp./Blendon Twp. 2017 Daniel T. Spearman Plainfield Twp. 2017 Ted L. Stautz Manchester Twp. 2017 Joseph C. Tomich Ash Twp. 2017 William Toth, Jr. Superior Twp. 2017 Ivan "Ike" VerHoeven Park Twp. 2017 John F. Wallace, Jr. Manchester Twp. 2017 Herb A. Widmayer Manchester Twp. 2016 Daniel L. Axtell Venice Twp. 2016 Glen W. Baker Norwich Twp. 2016 Michael J. Bentley Venice Twp. 2016 Gale L. Carrick Richland Twp. 2016 LaVerne C. Cook Sigel Twp. 2016 Clifford G. Dease, Jr. Kimball Twp. 2016 Thomas C. DeMoines Frederic Twp. 2016 Wayne E. Dougan Kimball Twp. 2016 George E. Douglass Richland Twp. 2016 Robert G. Erber Higgins Twp. 2016 Eric "Rick" A. Ericson Ann Arbor Twp/Brighton City Ted Talk to me on this on. 2016 Ray L. Evans Dryden Twp. 2016 James E. Fasnaugh, Jr. Potterville-Benton Twp. 2016 Paul J. Fisk Richland Twp. 2016 George E. Flaugher, Sr. Nottawa Sherman Twp. 2016 Thomas L. Healy Kenockee Twp. 2016 Jeffrey R. Hiltner West Bloomfield Twp. 2016 Frank G. Hyrman Gaines Twp. 2016 John P. Hyrman Gaines Twp. 2016 Robert "Me Bob" D. Kaszubowski Alpena Twp. 2016 Fred E. Kelbey Albee Twp. 2016 Harold R. Kulhanek Maple Grove Vol. 2016 Bert F. Luoma Saginaw Charter Twp. 2016 Richard L. Meister Delta Twp/Potterville-Benton Twp. 2016 William D. Merillat Jerome Twp. 2016 Douglas Pentzien Richmond Vol. 2016 Donald Paul Piggott West Bloomfield Twp. 2016 David D. Riedel Roscommon Twp. 2016 Darrell E. Rigsby Holly/N.O.C.F.A. 2016 Ryan J. Roseboom Freeport Area Vol. 2016 Gary R. Schuelke Alpena Twp. 2016 Harold L. Shands Kimball Twp. 2016 Daniel P. Sharp East Lansing/Eaton Rapids Twp. 2016 George W. Smith II Grattan Twp. 2016 James E. Stoddard Frederic Twp. 2016 Frank "T-Bear" Thibert Roscommon Twp. 2016 Gerard "G.T." A. Tomaszewski Alpena Twp. 2016 Ray "Marty" Westlake West Bloomfield Twp. 2016 Timothy R. Whipple Ingham Twp. 2015 Richard W. Armstrong Frenchtown Twp. 2015 Stephen C. Bayer Deerfield Twp. 2015 Richard L. Bentley Venice Twp. 2009 Harold A. Goyette Independence Twp. 2009 Kimberly S. Grabow Macomb Twp. 2008 Robert Gerlach Frenchtown Twp. 2005 Thomas J. O'Brien, Jr. Independence Twp. 2005 Thomas J. O'Brien, Sr. Ontonagon Vol. 2003 Kenneth E. Theile, Sr. Tri-Twp. 2001 Roy A. Saunders Memphis Vol. 1999 Richard N. O'Dell Mt. Morris Twp.